We are a personal web and internet marketing consulting company that believes passionate, like-minded teams change the world. We fix, design, and develop anything web-related, and bring more customers to your website. We serve small-medium businesses, are committed to our clients success, and have a 100% Satisfaction Guaranteed policy. Each of founding three members came from different cities to Tallahassee, Florida to become FSU Seminoles. While in college we focused on different disciplines, but became great friends. After school we brought our talents together and created a vision to help small businesses grow online. Thus we started Web Consulting & Marketing! 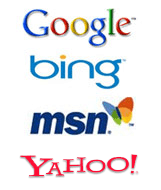 Get Found in the Search Engines and Learn How to Attract Customers! Logos are registered trademarks of their owners.